Hull-House, Chicago, April 21, 1909. 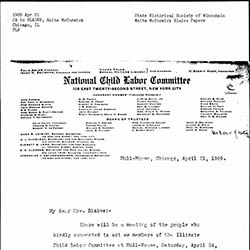 There will be a meeting of the people who kindly consented to act as members of the Illinois Child Labor Committee at Hull-House, Saturday, April 24, at four o'clock. Steps will be taken to organize the committee, and a discussion will follow upon the proposed amendment to the Child Labor Law embodied in House Bill 459 now before the State Legislature. You are urged to be present. 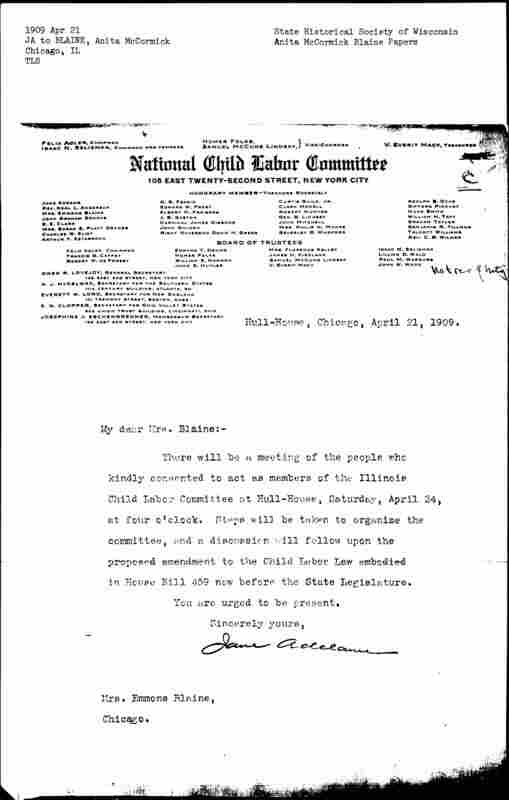 Addams invites Blaine to a meeting of the Illinois Child Labor Committee. 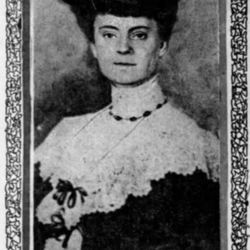 Addams, Jane, “Jane Addams to Anita McCormick Blaine, April 21, 1909,” Jane Addams Digital Edition, accessed April 25, 2019, https://digital.janeaddams.ramapo.edu/items/show/2388.